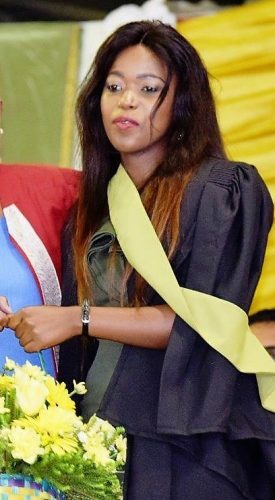 Former first Dean of Management Sciences turned entrepreneur attended Mangosuthu University of Technology’s (MUT) second graduation ceremony to congratulate ‘star employee’. Nana Ngobese attended the second MUT graduation on Wednesday, 10 April 2019, to surprise her ‘star employee’, Slindile Hlongwane, with flowers at her graduation. Hlongwane is employed as a junior Quantity Surveyor at Oro Projects, Ngobese’s company. Ngobese has a long history with MUT through her and her husband’s work as academic staff in the University. It was through their stay at MUT that they identified the qualities that they like about the University’s students. “We only take Mangosuthu students because I worked here in Mangosuthu in the 20s. I was the first Dean of Management Sciences and my husband was a Mechanical Engineering lecturer,” said Ngobese. “We run an engineering and construction company and we only take Mangosuthu students. We have a very close relationship with MUT, which still has the best students that you could ever have in terms of attitude, hard work and they understand the African environment where we work. We don’t have to explain to them that they have to be respectful and they have to work with local people,” said Ngobese. This quality sets MUT apart from its peers. “What Mangosuthu University of Technology is doing is total different from other universities who don’t have community understanding because their students don’t have the community touch,” said Ngobese. “I think Mangosuthu students do that better”. Ngobese’s company employed 25 MUT students for Work Integrated Learning but the project finished. “We were forced to take some students from Vaal because the project was in Vaal,” said Ngobese.